PREHEAT oven to 375° F. Lightly grease 8- or 9-inch-round cake pan. Melt ¼ cup butter; set aside. Combine ⅔ cup granulated sugar and cinnamon in another small bowl; set aside. 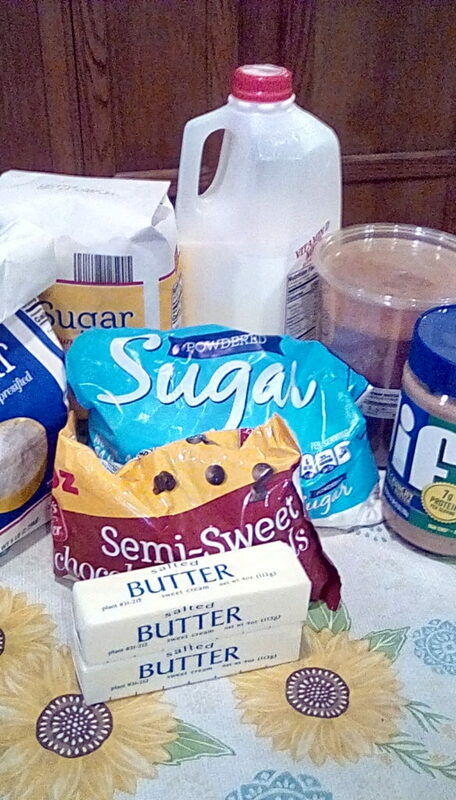 Combine flour, remaining ¼ cup granulated sugar, baking powder and salt in large bowl. Using 2 knives, cut in remaining ⅓ cup butter until mixture resembles coarse crumbs. Stir in chocolate chips and peanut butter. Add milk; stir until dough holds its shape. Transfer dough to slightly floured board. Knead dough and form into a ball, flatten slightly. Cut each wedge into four equal pieces. When finished you should have 16 pieces. Roll each ball in melted butter and then in cinnamon-sugar mixture. Bake for 30 to 35 minutes (25 to 30 for 9-inch pan) or until wooden pick inserted in center comes out clean. Carefully invert onto wire rack. Cool slightly. Invert again onto serving platter.